For watching videos streamed by Netflix, Amazon, Vimeo, and other online movie services, it's hard to beat the ROKU set-top box. Simple, inexpensive, and small, it just gets the job done with a minimum of fuss. Now the ROKU devices are getting even cheaper thanks to looming competition from Apple TV. A ROKU set-top box is small -- only an inch tall, and about 5 inches square. The device comes in three models. The basic HD model ($59) offers 720p resolution, 802.11g WiFi reception (and an Ethernet port), plus HDMI output. The mid-range model, the XD ($79), adds 1080p resolution (if content providers offer it), a fancier remote with features like still-image progress checks during fast-forwarding, and single-band N WiFi. The high-end XD/S ($99) has the same features as the XD plus component video and optical video outputs, dual-band N WiFi, and a USB port for playing videos, photos, and music from local sources. So how does your movie travel from the Internet, to the ROKU set-top box to your TV? The ROKU box connects to the high-speed Internet router provided by your phone or cable provider. This can be either a wired (standard ethernet network cable) or wireless connection. Then you connect the ROKU box to the TV, using any of the ROKU output ports, which include S-Video, Component, Composite, or HDMI. Content is delivered by multiple partners who stream their content over "channels" to the ROKU device. ROKU's Channel Store features over 75 channels at this writing including Netflix, Amazon Instant Video, Hulu Plus, UFC, MLB.TV, and other premium channels. Amazon videos cost just 99 cents each, for example, and that's the purchase price, not a rental as with Apple TV. Each channel provider has its own pricing scheme and some providers operate multiple channels. Free channels include NASA TV, ROKU Newscaster, the TWiTV.tv network, Mediafly, CNET TV, the Frame Channel, Proud Television, and many more. There are about as many free channels on ROKU as paid channels. To subscribe to a channel you have to log into the channel's Web site from your computer, create an account, and then link your specific ROKU device to your account. This cumbersome process can be a pain when you first set up a bunch of channels. It seems strange that you have to go to a computer in order to set up accounts on the ROKU device instead of doing it through the device's on-screen interface. After all, you can search for movies on the device once you've set up a channel. On ROKU, there is no chronological programming directory; no way to find out "what's on now." To find a Neflix movie you can search the Netflix channel; to find a movie on Amazon you go to the Amazon channel. But there is no cross-channel search function. Compared to the cheapest Google TV device ($300), ROKU is an amazing bargain. Even Apple TV, with a $99 price point, doesn't support 1080p. ROKU is still the king of streaming video set-top boxes, and will keep you from spilling popcorn on your PC, but it will have to keep refining the user experience to stay ahead of emerging competition. Most recent comments on "Streaming Internet Movies to Your TV"
May I suggest an article regarding Keyboard-Set top TV boxes. For really searching the Inet for media to watch nothing beat a wireless keyboard. We have the $99 Roku and love it! Wireless set up was quick and easy. Four months after getting it, we are still watching movies almost daily. I go to NetFlix via my computer to find movies we'd like to watch and mark them. When we go to NetFlix via Roku - they are noted and easy to find. Only complaint: somewhat limited movies at NetFlix. I've had a Roku for a long time, and for the most part, it's worked well. It's easy to move it from room to room, with connections to HDMI or to component, thus the age of your TV isn't usually a problem. There are tons of channel options on there. Other - and free - streaming options are regular Hulu, IMDB, Fancast, and network sites, which you can get on a PC or Intel Mac and, provided you have an HDMI connection, port to a TV with an HDMI input. I am using Ubuntu as my Operating System . Will NetFlix work with Ubuntu or do I have to have Windows? Thank you. ROKU says they are working on this. I am also a Ubuntu user, and Netflix will not work with it. I am very close to buying a Roku for that reason. I've been looking at the HD Roku for a few months and it looks like a great way to get internet movies to stream on the TV. I'm still waiting, however, for some "box" to be able to do all the Roku things plus stream from another computer (my desktop where I have many AVI/MPEG movie files). 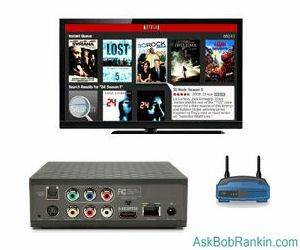 Will Roku stream from another computer on the same LAN, or if not, is there any "box" that incorporates that feature as well as Netflix, etc? One important piece of info is missing: where in the world are these services available? I eagerly looked into Amazon Instant Video, and they disappointingly state "Only available in the U.S." due to restrictions given by the content providers. If this is also true for the other services, all your readers outside the U.S. could save the effort of checking ... Please give an account of this? Why does anyone need a special box to watch streaming Netflix movies. Just hook up the computer to a HDTV via the VGA port, and to the internet, and thats all there is to it. I've been doing it for quite a while now with no problems what so ever. I have the Roku basic on two televisions and I just love it. The picture comes through beautifully and you can also stream pandora through it. If you have a newer TV, it is easy to connect. Try it! Does a Roku work with a tv not connected to cable or satellite? It sounds like it should work but I thought I'd ask. I have a tv that my son only watches dvds on since there is no cable connection in his room. It would be great to have a way to stream movies from Netflix. I did a lot of research before I bought my WD TV Live Plus (Western Digital HD Media Player) from CompUSA for $100. It supports 1080p, has 2 USB ports to hook up a thumb drive or external hard drive and an ethernet port to hook up to a router to watch Netflix and many other on-line services. The tipping point for me was that it can stream video, music and pictures from any computer on your network if you share the directories and it is just as small as a RoKu but supports a lot more video formats. The only downside is that it doesn't support HULU Plus yet (a future firmware update will) and it is not wireless without adding an adapter. Tom S. is spot on. I tried the Roku box but found the menu extremely klunky and linear. If you start at the top of your Netflix list, for ex., you have to scroll through every single selection to get to the bottom. Pull that old PC out of the closet, buy a wireless keyboard and mouse and have all the flexibility and convenience of a hypertext environment. Bookmark all the various streaming video sites on the net and enjoy. Yes. Sadly, you have to run Windows for this if you have Netflix. But the Linux world is anxiously watching the development of Amazon's streaming service. I dare say as soon as their offerings approach Netflix's, there will be a mass exodus of Linux users to Amazon. I have the same question that Bob has. Will Roku stream from another computer on the same LAN. I would really like to see the movies and photos that are on my laptop on my TV. My question is I bought a Panasonic Blue Ray SC-BT300 7.1 surround sound $599.00 for $249.00 last year @ Best Buy. The young saleman saying is was Netflix able. Well 7 months later finally connecting to the Net, this box not allowing Netflix to work. Calling Panasonic tech department, this is a 2009 model and will not work. They have NO PLANS to update the software. Is there any other devices to make this system work? I like my Roku, but am frustrated with the selection of content. Rarely can I find anything on Netflix that I want to watch -- especially anything remotely recent. For something I'm paying for, there just isn't much there, compared to the entire Netflix library. Also, I assume you must have meant that Amazon Instant Video *starts* at $0.99 each. Pretty much anything you want to watch is $3.99. I have ROKU and I never use it. I don't like the frequent buffering that is typical for me when viewing HD programming. Also, I prefer to stream live video such as ESPN3 which ROKU does not support. Please note, the cheaper HD does not have the Ethernet port; only the $100 XS model. So it is no go for me as I prefer the speed and security of hard wire. I have a question about these video-streaming devices. I bought one, RCA brand, and had to return it becuase it did not work with my internet connection, which is a Clear Spot. Is there any brand of device that works with this, or do I have to resort to the expensive internet from cable companies or satellite? Thanks for any help or advice. By the way, I am new to your site and let me say it's awesome! I have learned so much in just one day.